Receiving quality eye care should not be postponed due to lack of insurance coverage. At Atlantis Eyecare Torrance we want to ensure all of our patients can enjoy the best eye care possible and to help finance this, we have partnered with CareCredit™ - the leading medical financing company in Southern California. Whether your insurance does not cover a certain procedure, or you have no vision insurance at all, CareCredit has financing options that fit every budget. Our insurance and financing experts can help you determine what your insurance does cover and should there be a short fall, they will work with you to help with obtaining financing. Clear vision is not a luxury. We want our patients to get the care they need when it is needed rather than postponing care to some future date. CareCredit has made their application procedure fast and easy. They understand there is no time to wait for lengthy approvals to obtain medical care and so provide an instant approval feature to their application. 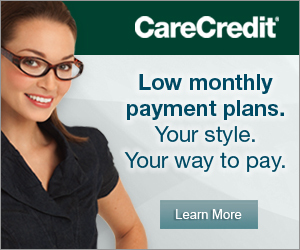 CareCredit offers several financing options for LASIK and premium intraocular lenses. Patients can have interest free financing for 6, 12, 18, or 24 months. If a longer payment term is more attractive, patients can get low interest financing for 36, 48 or 60 months. Our finance coordinator can help you apply online if necessary or you can apply via their toll-free line at 866-834-3207. 0% INTEREST IF PAID IN FULL WITHIN THE PROMOTION PERIOD OF 12, 18, OR 24 MONTHS. For balances that remain unpaid past the promotional period, interest will be charged. Late payments and other defaults will incur interest as well.